Designed for frequent movement on an Executive or Clerical chair and contemporary furniture. Polyurethane tires for carpet or any smooth hard floor, Rubber tires are great for Hardwood or any hard surface. The Crown Tread on the wheel enhances the ability to swivel and change direction. 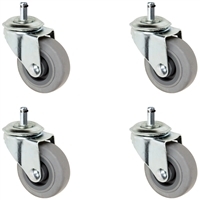 A Precision sealed ball bearing in the wheel provides easy rolling and never needs maintenance. The swivel bearing at the bottom of the stem has 2 rows of balls for easy turning. 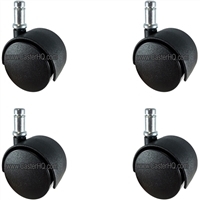 Comes only in a chrome finish for a clean, elegant appearance or a Black Hooded Finish as well. 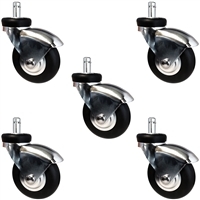 The Polyurethane or Rubber wheel is available in a 2" & 3" diameters. 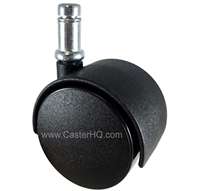 Grip Ring Stem - 7/16" x 7/8"
Overall Height when Attached: 2 5/8"
Set of 5 Premium 2" Chair Casters = 375 LBS Cap Per Chair!